Get deeper visibility into critical network devices from SolarWinds. With Network Insight for F5 BIG-IP load balancers, Cisco ASA firewalls, and Cisco Nexus switches. SolarWinds is dedicated to continually bringing you better information about key network gear so you can manage your network, not your network monitoring. Try it today with Network Performance Monitor and Network Configuration Manager. Networks today often contain complex hardware that isn’t well-covered by standard monitoring tools. Network Insight simplifies the management of complex network devices by providing the right information for each device's unique role in the network. Help ensure service availability with health and performance monitoring of critical data center switches. Get visibility into virtual port channels and virtual device contexts, and manage thousands of interfaces more easily. 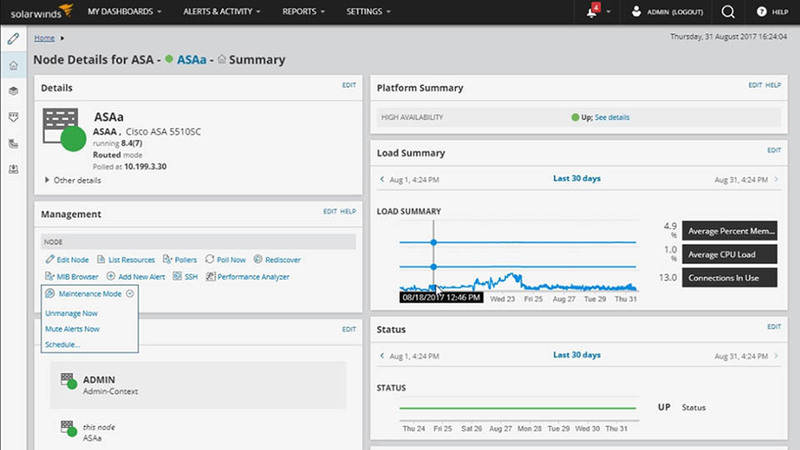 Automate the monitoring and management of your ASA firewall infrastructure in a single unified platform. Easily monitor the connectivity of VPN tunnels, user VPN sessions, and ASA High Availability. Monitor every access list to detect and eliminate shadowed or redundant rules. Manage your entire application delivery environment, visualize component relationships and dependencies, and isolate service issues using one unified interface. Troubleshoot complex gear like an expert with Network Insight, a feature of Network Performance Monitor and Network Configuration Manager.